Real Fruit LLC is a gourmet drink company located in Painesville, OH. We trace our roots back to 2006 when we first started to design & cultivate our first signature flavors. In 2011, we brought these flavors to Northeast Ohio & have received a roar of approval from our now loyal & ever growing fan base. “The Shake-Up” as the package to deliver these truly unique gourmet flavors to our many loyal customers. 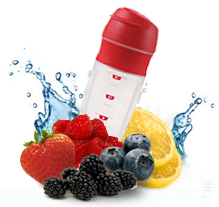 The Shake-Up is a combination of water, ice, sugar, & fruit. It is shaken, not blended. Most commonly you can find these at fairs & festivals as lemon & orange Shake-Ups or handmade lemonade. Here at Real Fruit we have taken this basic concept & revolutionized it from the ground up. By using only the best fruit we can find, pure water & ice, our secret all organic sugar recipe, we have found a winning combination that is sure to please. All of our shake-ups are hand-shaken fresh to order so you can get the best drink each & every time.